Returning to poverty is a bigger risk than previously understood and policies should be redesigned to tackle extreme deprivation. So says a new report from the Overseas Development Institute. Unless we directly address extreme deprivation and wealth security, a billion people may still be poor by the year 2030 according to The Chronic Poverty Report, which aims at influencing the next Millennium Development Goals which will establish global development objectives from next year onwards. Using panel data, which tracks people over time, the report shows that escaping poverty is only the first hurdle; relapsing is a real danger. 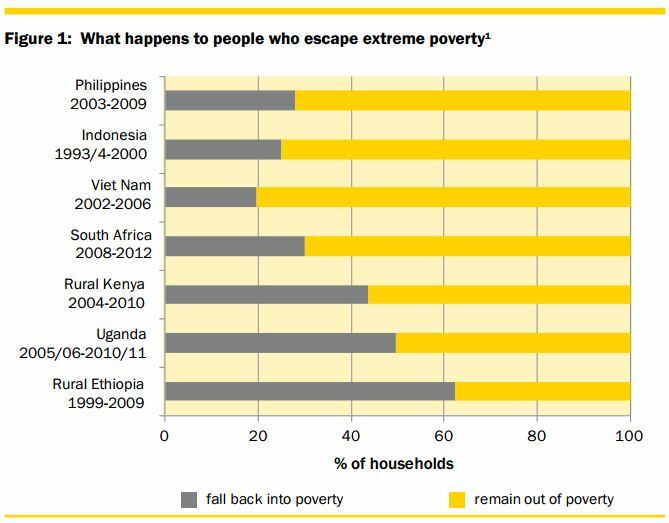 In rural Kenya and in South Africa, surveys over different time-periods found that 30% to 40% of those who managed to escape poverty fell back, rising to 60% during one recent period in rural Ethiopia, as shown in the following diagram. includes, for example, disaster-risk management, universal health provision and social protection. The report points out that the answers will vary between countries but that several policy generalisations can be made. In South Asia the poor are often excluded from economic growth. Laws and rights are important. Legislation for minimum wages is proven to work well and should be expanded. the development of social assistance (cash transfer) systems is the major policy challenge for the next five years. Countries that have not developed these by 2020 will have very little chance of getting close to zero poverty by 2030. It is no accident that Ethiopia, with its Productive Safety Nets Programme, is among the countries seen as making progress. The ODI also says that higher domestic tax revenues are needed given that most governments don’t spend much on the deprived. This is in opposition to the standard view of the past two decades which said that shrinking government spending would reduce poverty by promoting market forces. International aid can also support the reduction of chronic poverty. The study supports the view that insecurity may be a bigger problem than simple lack of income. Poverty is multi-dimensional, consisting of at least access to resources, power and gender imbalances. Inequality and insecurity in a middle-income country can feel almost as bad as extreme deprivation in a country with very little wealth. Poverty dynamics have been somewhat neglected until now, meaning that many donors and governments believed that once they had helped the underprivileged escape poverty, their job was done. The study shows that without health, education and opportunities, the risk of relapse is very real. I’m so glad you covered this! It is such an important topic that, like you said, often gets left out of the debate! Also, I wonder what you mean with: “International aid can also support the reduction of chronic poverty.” At the risk of going into the whole aid is good vs. dead aid debate, I was wondering where you stand in all of that muddled up mess? On aid: I actually think there’s less of a debate than people like Dambisa Moyo suggest. Of course some aid has been wasted and mistakes have been made, but aid broadly works and is essential. The anti-aid debate plays well to those people who don’t care about the poor. Some of Moyo’s recommendations are ridiculous, such as African governments borrowing privately on the international capital markets. If Italy, Iceland, Greece, Ireland, Portugal and Spain can’t borrow sensibly (never mind the UK!) then the Central African Republic will certainly struggle! She also, bizarrely, fails to count interest earnings from loans to Africa, making it look like overall aid is much bigger than it really is.